Kiwi Mango Smoothie - Pepper Bowl, healthy and best ever! Kiwi Mango Smoothie, a healthy, filling drink perfect for breakfast or for mid day meal. This a creamy, tasty and easy to make. 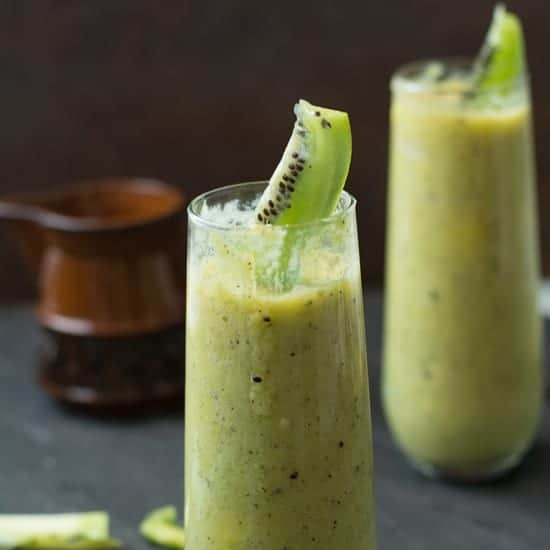 Kiwi Mango Smoothie, summer is nearing and it is the time for us to keep fit and balance ourselves with fresh fruits. Furthermore, to maintain the good physique, it is important that the food we take should be high in nutrients and low in calories. No matter what, we need to hydrate ourselves with the tons and tons of liquid like smoothie, specifically on the warmer months. It is more beneficial if you intake lots of fresh fruit juices rather than and the ready made store-bought ones. Here, I don’t mean to say that store-bought are not good at all, but all I mean to say that making fresh fruit smoothies at home from the scratch is great and does ensures good health. And I’m sure no one will disagree with this fact. When it comes to fresh fruit, I do not worry about the type of fruit. I literally go with any fruit that is available in that season. Mother nature provides us the correct nutrients, minerals on the correct season. It is always good to use with what nature is providing us like this Kiwi mango smoothie. So, it is wiser to go along with the nature. And that is the intention for creating this post. Mango and kiwi are abundance now. And I’m already seeing loads of mango and kiwi, here in Pennsylvania. Can anyone miss a chance of picking this adorable garden fresh? The vibrant green of kiwi and the bright yellow color of mango are the best color combinations. These combo works in this smoothie as well. Kiwi mango smoothie is pleasant to the eyes and tastes yummy. The mango always transforms into different dishes. I make sure that I follow different recipes whenever using fruits. I keep changing the recipes to make it fresh and more delectable for every time. Which makes the cooking more fascinating to me and gives more interest to my family members to come enthusiastically to the table for eating. 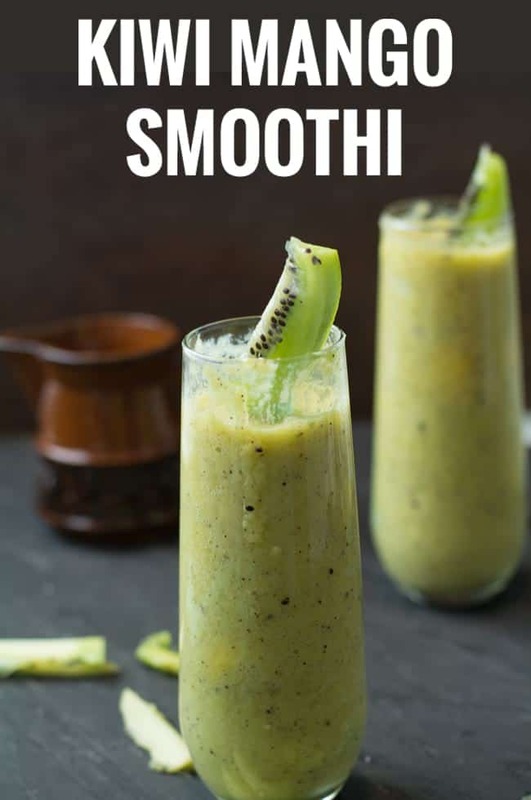 Once you start making smoothies on your own like this kiwi mango smoothie, you will stop buying store-bought so-called fruit flavored yogurt, which are artificially sweetened and artificially colored. Obviously, not good for health. So, start learning about the right combination of fruits that tastes delicious. There by, start saving money by making your own. On the other hand, making kiwi mango smoothie in your kitchen is more adaptable, can be tailored to suit your taste. Mango- Healthline says, this is low calorie fruit which is high in fiber. A good source of vitamin C and rich in vitamins, minerals and antioxidants. And good for hair and skin. Kiwi– The Healthline says, this fleshy green fruit is a good source of vitamin c, vitamin k and vitamin e, folate and potassium. Additionally, packed with antioxidants and fiber. Yogurt– The same Healthline says, Yogurt is a good source of calcium, vitamin b12, riboflavin, prosperous and magnesium. It also helps in digestions and maintains good metabolism. Any serving suggestions for this smoothie? This kiwi mango smoothie is great to serve in breakfast. Moreover, it is perfect to have as a mid-day meal. A very full filling dish that is easy to make as well. How long this smoothie can be stored? Great to serve when freshly made, and I personally feel that it loses it color and the tastes when stored for a longer time. Hence, it is ad visible to consume immediately once made. How does this Kiwi mango smoothie tastes like? You all know the mango and kiwi are flavorful and tastes unique on their own. These does compliments well when combined with the creamy yogurt. It is creamy, sweet and mildly tangy. Each of the ingredient’s flavor is perfectly balanced with the co ingredients. There are many verities belongs to the mango family. The one which is commonly found here in Pennsylvania has thicker skin. Some of you may find it difficult to cut the mango because of its thick skin and bigger pit inside. The pit inside the fruit occupies around 30% of the fruit size depending on the verity. Run your knife slightly away from the center. If you are a beginner start slicing them in smaller portions. The ripen mangoes are great for making smoothie. To test, the mango has to be soft when touched. Same as mango, mango kiwi smoothie tastes yum when the fruits are fully ripened. If the fruits are firm, here is the pro tip. Wrap it in the paper bag and allow them to sit on the kitchen counter till the fruits become soft to touch. The seeds are tiny and hence it is easy to prepare to make the mango kiwi smoothie. This has got fussy skin, wash and clean thoroughly. Peel off the skin or scoop the flesh using spoon. Plain non fat yogurt is great. And when planning to serve to children, you may opt for full fat yogurt. Both the versions are great to taste. I have made today with natural sweetener that is Honey. But you may substitute with sugar, coconut sugar, or other choices of yours. Or if the fruits are sweet enough, then you may omit using the sweeteners. paleo: Replace yogurt with coconut milk or almond milk. Keto, Whole30: Swap yogurt with coconut milk or almond milk. And avoid using the honey. Mango kiwi smoothie Vegan: Follow the above for yogurt replacement and Instead of honey use palm or coconut sugar. I know morning hours are busy for you. I’m reading your mind, making our smoothie involves laborious work like peeling and cutting. But this problem can be easily overcome by preparing the ingredients ahead of time. The peeling and cutting can be done well in advance, say before night. But refrigerate peeled and sliced fruits in an air tight containers. Refrigerate the yogurt separately. Combine them in a blender whenever needed, thus can save time and last-minute hassles. This smoothie is the basic recipe and has room for tons of variations. This does tastes great when combined with other special ingredient like the following. Kiwi spinach mango smoothie– For the quantity described in this recipe add a fist full of spinach. This adds nice color and texture to the smoothie. Mango kiwi banana smoothie– You may add half a banana for this quantity. Banana adds a beautiful flavor and great creamy texture to the smoothie. Mango kiwi strawberry smoothie– The flavor and the color of this smoothie multiplies when strawberry is added. To this same basic recipe, you may add lovely looking strawberry. 2-3 strawberries would be fine for this smoothie. Kiwi Mango Smoothie, a healthy, filling drink perfect for breakfast or for mid day meal. This a creamy, tasty and easy to make. One of our most favorite smoothie in this summer season. Wash and clean the fruits. Peel the kiwi and mango skin. Remove the pit from the mango. 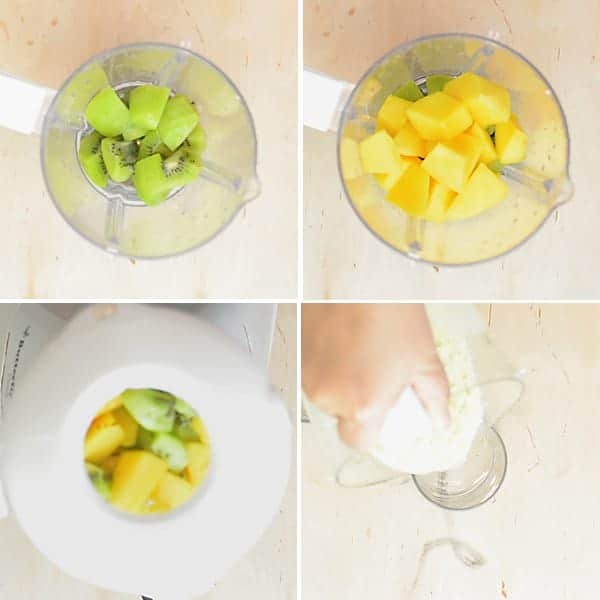 In a blender add mango flesh, kiwi flesh, yogurt and honey. Pulse until it turns smooth and silky. Taste and adjust sugar level. Do not miss latest recipes and its tips, Follow us on Facebook, Pinterest, Instagram. Thank you Rafeeda for your sweet comments!